This part is a promoter. It has a strong RBS restriction site following it which can guarantee the high efficiency of our project. This part is a promoter which is associated with a RBS(Ribosome binding site). It’s used to be a part which both has the function of the promoter and Ribosome binding site. The Plac promoter starts the whole work and the rbs30 with it ensure the high efficiency of ribosome binding.This part can improve the efficiency of our construction work we can use this part instead of linking parts every time we construct a plasmid. This part is sequenced as correct after construction. A double-enzyme digestion test was implemented to verify this part. The length of the digested DNA fits the design. The function of this part was examined by the GFP assay. 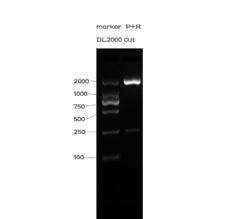 The Plac+RBS30+GFP+Ter plasmid transfected E.coli BL21 (DE3) was cultured and IPTG induced. The groups without IPTG supplement were set as negative controls. Subsequently, the fluorescence intensity (abbreviated as FI, Ex: 488 nm; Em: 538 nm) were determined by the Fluoroskan Ascent FL (Thermo Scientific) every 2 hours. Figure 2. 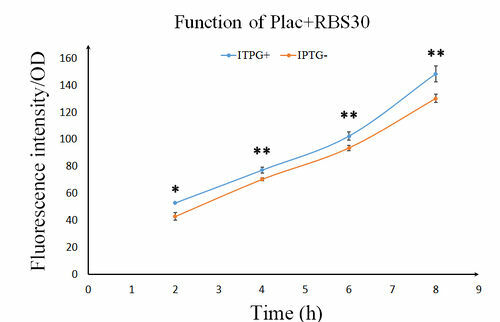 Evaluation of the Plac+RBS30 by split GFP assay. The green fluorescence (Ex: 488 nm; Em: 538 nm) of split GFP was detected every two hours after IPTG induction. Relative fluorescence intensity was calculated with normalization of OD600 value. This experiment was run in three parallel reactions, and the data represent results obtained from at least three independent experiments. **p<0.01, *0.01<p<0.05.